Homebuyers tend to have a strongly favorable opinion of green features, if the impact on price is not mentioned, according to NAHB’s publication What Home Buyers Really Want. And the recent McGraw Hill Construction Smart Market Report, Green Multifamily and Single Family Homes: Growth in a Recovering Market also found that buyers seeking green features were most drawn to energy savings…and saving money. But can the two co-exist? Builders are definitely including more and more of the features. 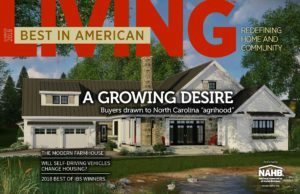 The Best in American Living article, Keen for Green: Eco-Friendly Features Buyers Want (and Which Ones Buyers Actually Include) investigates how buyers and green features are trending in a market predicted to translate to $80-101 billion by 2016 based on current forecasts.